In 2016, left-wing and anarchist terrorist groups or individuals in the EU carried out 27 attacks. This was a sharp increase, compared to the number of attacks that occurred in 2015. 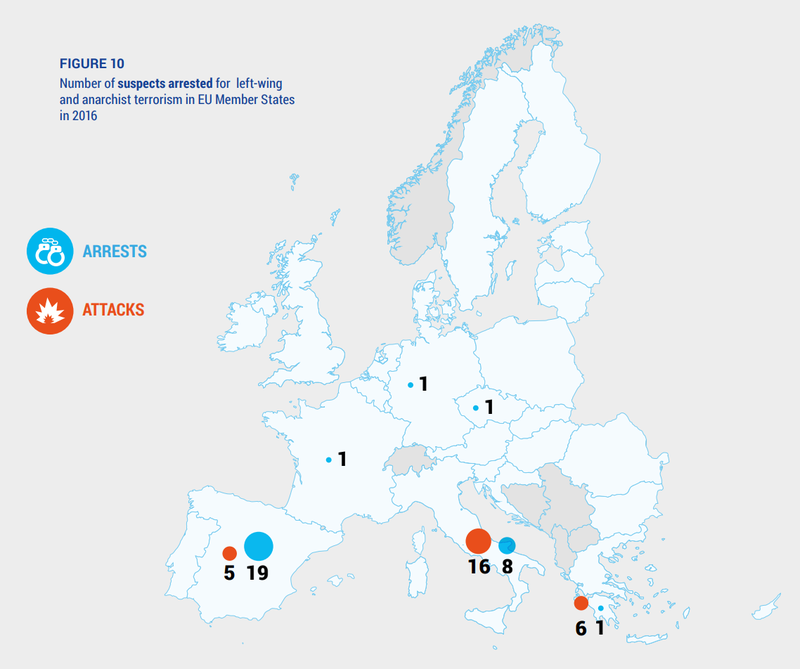 EU Member State authorities arrested 31 people related to left-wing and anarchist terrorism in 2016, most of them in Spain. Italy, Greece and Spain were again the only EU Member States to experience left-wing and anarchist terrorist attacks. Over the past two decades, anarchist terrorist groups in these three countries have developed similar characteristics, used the same modi operandi and endorsed similar agendas. In 2016, there were no coordinated terrorist campaigns across the three countries. However, it is assessed that some attacks in Italy were carried out in response to a call for action by imprisoned anarchist terrorists in Greece. In Italy in 2016, a total of 16 attacks were carried out by leftwing and anarchist terrorist groups. Although the incidents increased in number compared to 2015, it appeared that the operational capabilities of the groups remained low. The majority of the attacks in 2016 were carried out using unsophisticated improvised incendiary/explosive devices (IID/IEDs), containing flammable liquids or gunpowder and crude ignition mechanisms, some of which failed to operate. Eight people were arrested on charges related to left-wing and anarchist terrorism. 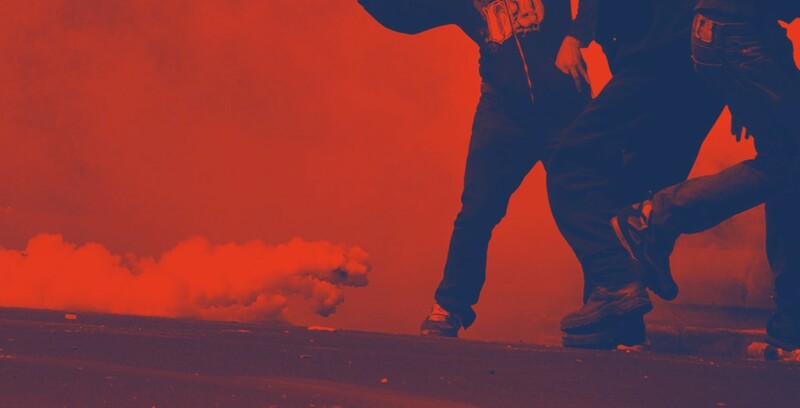 Italian anarchist terrorist groups targeted facilities related to the management of migration-related issues in general; and to the function of the Identification and Deportation Centres (CIE) in particular. Five victim-operated improvised explosive devices (VOIEDs, parcel bombs) were sent between February and September to travel agencies and companies related to the CIEs, without causing injuries or damage. Italy also experienced the re-emergence of Federazione Anarchica Informale/Fronte Rivoluzionario Internazionale (FAI/ FRI, Informal Anarchist Federation/International Revolutionary Front). In January for example, its Pyrotechnical Committee for an Extraordinary Year cell placed an IID outside the Courthouse of Civitavecchia in Rome, causing damage. In June, two VOIEDs were sent by the Danaus Plexippus FAI/ FRI cell: one was addressed to the European Food Safety Authority in Parma and was detected by security personnel; the other was sent to a private biotechnology company and caused minor injuries to the firm’s owner. A FAI/FRI cell is also believed to have placed an IED outside a Carabinieri Station in Bologna that caused damage to the building. In Greece, it appears that left-wing and anarchist terrorist groups have retained their operational capabilities as well as their access to weapons. In 2016 they carried out six attacks involving the use of IEDs, firearms and grenades. In October, Synomosia Pyirnon tis Fotias (Conspiracy Cells of Fire) placed an IED outside the residence of a prosecutor in Athens. The powerful explosion caused significant damage. The Organosi Epanastatikis Aftoamynas (Revolutionary Self-Defence Organisation) adopted a more international scope in its attacks. It targeted two foreign embassies in Athens: in July, its members carried out a drive-by shooting against the Embassy of Mexico and caused minor damage to the building; in November, they threw a hand grenade at the Embassy of France, slightly injuring the police officer guarding the premises. In Spain, left-wing and anarchist terrorist activities remained at low levels. Five attacks occurred in 2016 but did not involve extensive operational planning or the use of sophisticated IEDs or firearms. Notwithstanding this, 19 people were arrested in relation to left-wing and anarchist terrorism. The number of arrests in the country has remained consistently high, with a total of 100 people arrested since 2013. This has apparently had an impact on operational capabilities, mainly of the anarchist terrorist groups, causing a decrease in the number of attacks over the same period of time. Of interest is that members of Spanish extremist groups adhering to communist ideologies joined Kurdish militias in Syria and Iraq, and were actively involved in combat activities against the so-called Islamic State (IS). It remains to be seen how their participation in the conflict will affect their activities on Spanish soil. Marxist-Leninist terrorist groups in the EU have ceased to be operational and limit their activities to propaganda. However, the Turkish Devrimci Halk Kutrulus Partisi/Cephesi (DHKP/C, Revolutionary People’s Liberation Party/Front) remained active in Turkey and carried out five attacks, targeting police, judicial and government employees. The DHKP/C has never conducted attacks in the EU but retains a network in several EU Member States that provides financial and logistical support to operatives in Turkey. Its structures in the EU operate partially under the cover of legally established associations. In 2016, one Dutch citizen was arrested in Germany on charges of terrorism financing connected to the DHKP/C. 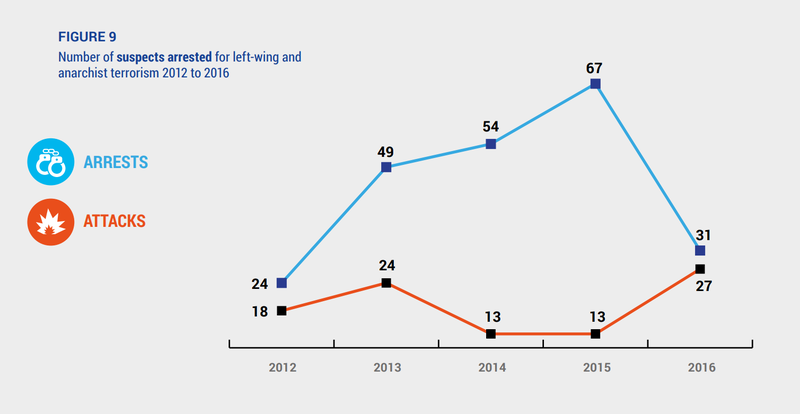 In 2016, left-wing and anarchist extremist groups and individuals remained a public order threat in a number of EU Member States. Their activities included riots, arson attacks, criminal damage and spreading propaganda. Left-wing and anarchist extremists continued to take advantage of lawful demonstrations to launch violent attacks against governmental property and law enforcement. Anarchist groups and individuals tended to be more violent than those belonging to left-wing extremist movements. Anarchist and left-wing extremist activities largely take place in urban milieu. In several cities in the EU, anarchists and left-wing extremists prefer to reside in specific areas. In these zones, they have established squats and “community centres”, where they plan and organise actions. Extremists are also very active in and around universities, where they can find opportunities for recruitment. Arson campaigns continued to occur in EU Member States with active anarchist communities. Groups and individuals employed unsophisticated IIDs or flammable liquids to torch their targets. In Germany, for example, anarchist extremists carried out numerous arson attacks in 2016, mainly targeting police and private vehicles on the streets. Belgium experienced similar problems with arsons of cars and cellphone masts. In Greece and Italy, anarchists are believed to be behind a number of incendiary attacks on vehicles and property as well as on banks. Apart from traditional means of propaganda, such as graffiti and leaflets, anarchist and left-wing extremists have extensively made use of the internet. Numerous websites, blogs and social media accounts provided “alternative news”, translated communiqués, conveyed messages of imprisoned extremists and disseminated propaganda material. There were no changes in the themes of anarchist and left-wing extremist propaganda in 2016. The main subjects remained the criminal justice system, politicians and political parties, the refugee crisis, socio-economic issues and the activities of right-wing extremists. In 2016, left-wing and anarchist extremists continued to travel around Europe to participate in violent and non-violent acts. For example, the “No Border Camp” which took place in Thessaloniki (Greece) in July, attracted left-wing and anarchist extremists from all over the continent. Their actions included violent riots and clashes with police forces in the city of Thessaloniki, as well as in rural areas in northern Greece. In addition, anarchists from Belgium were arrested in Germany, France, Finland and Switzerland for participating in riots and arson attacks. A French extremist was arrested in Germany, in execution of an international arrest warrant on charges related to participation in violent riots.